Have you ever wondered what the most dangerous jobs in America are? This infographic from Teletrac Navman lays out all of the facts and statistics, pulling data from the Bureau of Labor Statistics. 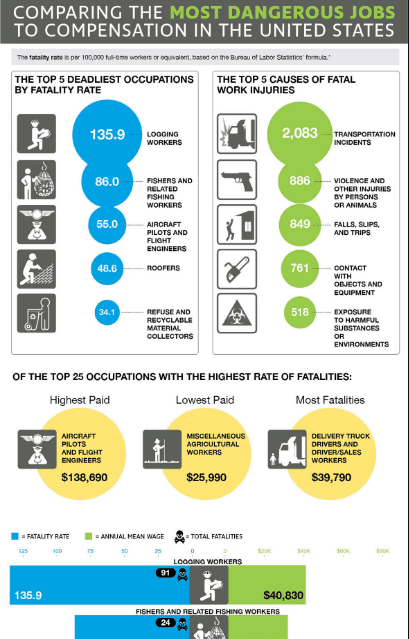 The data shows that the deadliest occupations in the United States (based on fatality rates) are logging workers, fishers and fishing workers, aircraft pilots and flight engineers, roofers, and recyclable material collectors. Based on 100,000 workers, the average fatality rate for logging workers is alarmingly high at 135.9! They're not even the highest paid workers on this list, either. That claim would go to aircraft pilots and flight engineers, where the average salary is $138,690, but the average fatality rate is a terrifying 55.0. The lowest paid are the agricultural workers at an average salary of $25,990, which is a huge disadvantage considering the risks that can be involved in the work.